MAITLAND singer STEVE SIMMONS will burst onto the stage at The Clubhouse Hotel, Maitland, Friday night with his new band HENRY'S ANGER. 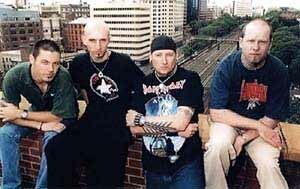 It has been almost a year since Simmons joined the Canberra-based heavy metal group, replacing frontman JAMIE THOMAS and going on to play the 2000 Sydney BIG DAY OUT in January. Simmons joined the group when it was at its strongest. The group's 1999 debut album PERSONALITY TEST reached number 38 on the alternative charts, and was nominated for an ARIA in the Best Rock Album category, alongside Australian heavyweights SILVERCHAIR, POWDERFINGER, COLD CHISEL and FRENZAL RHOMB. Formed in 1994, Henry's Anger made a major breakthrough in 1997 when British 'heavy music bible' KERRANG! awarded the band's 1997 CD BLACKLINING a '4K review'. Supports for DEFTONES, MR BUNGLE, SUICIDAL TENDENCIES, UNSANE, STRIFE, REGURGITATOR and THE MARK OF CAIN translated to good record sales for Henry's Anger. Other members of Henry's Anger are bass player ROD YATES, guitarist PADDY COFFEY and drummer MATT COFFEY.